Isolation movements are extremely important for your overall quality of your workout. 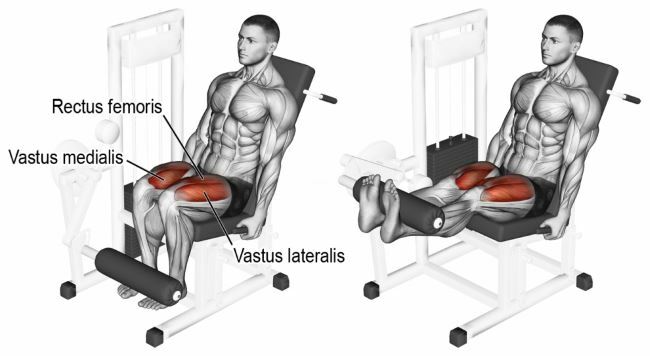 They aren’t really popular due to being subbed out by large multi-joint exercises, and nobody will ever ask you how much is your leg curl, but they are still vital on your quest to getting buff. This is because they can be just the thing you need after working on multi-joint exercises for a long period of time. They can help boost your strength and make your muscles larger, which you are probably looking for. Also, single joint exercises can be very beneficial because of their versatility. You can use them to create burnout sets that will get your pump going when you’re almost done with your workout, but you can also use them at the beginning when you’ve just entered the gym or literally at any time during your workout for no-nonsense muscle building. They also go well with intensity boosters. After careful consideration of tens of single joint techniques, here is a list of the top ten best ones. This exercise targets your hamstrings, and it can be used very effectively at the beginning of the workout. This is because the hamstrings are responsible for hip extension and knee flexion as well, so you want them up and running at their best. This is contrary to most programs, where hip extension is trained through the RDL, but when doing that you’re selling yourself short. Of course, you could do lying ham curls instead but after a research study from 2009 which pointed out that the Russian curl was the best isolation exercise for the hamstrings when it comes to EMG activity, you might want to reconsider them. However, this doesn’t imply that the Russian curl is better and should replace stiff-legged deadlifts or squats. However, when you add a few sets of it to your regular ones, things can only get better. To do Russian hamstring curls, put a pad on your knees and hook them under something sturdy or heavy so that they don’t move and mess up your workout. Also, you can put the pads and perform the exercise on a lat pull-down station. However, be advised that Russian hamstring curls are really difficult to do and a lot of people won’t even be able to do one when they’re starting to train them. If you find yourself unable to do a single rep, do negatives from the top position. If you eventually get to the elevated lat pull-down station, make sure that you have a broomstick or a dowel so that you can get yourself up. 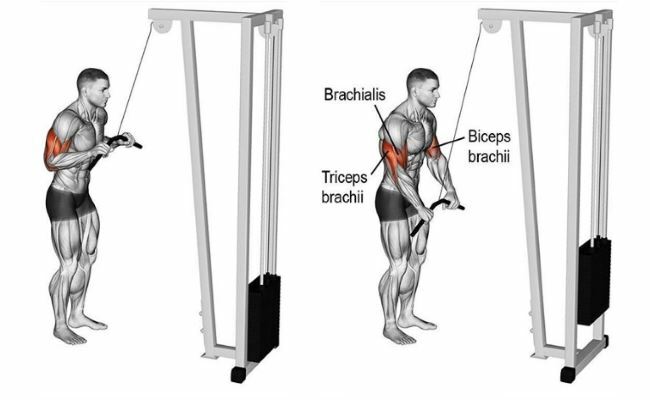 This exercise targets your biceps and not taking the multi-joint chin up into account, it is the best and most effective exercise for your biceps. If EMG research has ranked this exercise as decent, but nothing above that, why is it on this list? Well, the seated versions such as the preacher and concentration curls might give off a greater EMG signal, you can use so much more weight when you’re standing up! If you do standing barbell curls at the beginning of your workout with a lot of weight, you will overload the muscle and the effect will be much larger. If you have to cheat, keep it for your last one or two reps. Remember, always perform your exercises with proper form – if you have to use momentum to begin a rep, there is too much weight on the bar and you need to lighten it up a bit. For best results, take a wider grip at the bar to put more intensity on the short head, whereas a grip where your hands would be closer than your shoulder width would have better results on the long head. However, putting more pressure on one head or the other doesn’t mean you’re doing an isolation exercise. If using an EZ-bar is better for the joints on your arm, don’t hesitate to pick one up. This exercise targets your quads and while a lot of leg exercises target bigger muscle groups, that makes the rest of your workout much harder – you’re just too tired or too imbalanced to continue. So, to isolate the quads while avoiding the unpleasantness of being unable to stand afterwards, I would suggest doing some leg extensions. Usually, people will do this exercise at the end of leg day, but you can also doing before you waste all of the energy out of your legs, and it will help you feel like you’re lifting up a car when doing lightweight squats later on. However, that’s not the only thing that leg extensions are good at – they can help you with intensity boosting moves as well. If you want to put them into your regime, put them in a classic dropset, which means that you would reduce the weight after getting too tired and reaching muscular failure. After that, you just continue pumping along. Also, you can do forced reps, partials, slow negatives and a bunch of other stuff limited only by your imagination! This exercise even works well with blood flow restriction training, which will definitely make it harder for you to walk, or even stand! For best effect, turn your feet slightly inward because this will directly influence the vastus lateralis, but that doesn’t mean that turning them outward will work better on your vastus medialis. I know most people at the gym will point their feet directly forward and you might get some flak for not doing it, but don’t let peer pressure subdue you! This exercise targets your triceps, more specifically your lateral and medial heads. 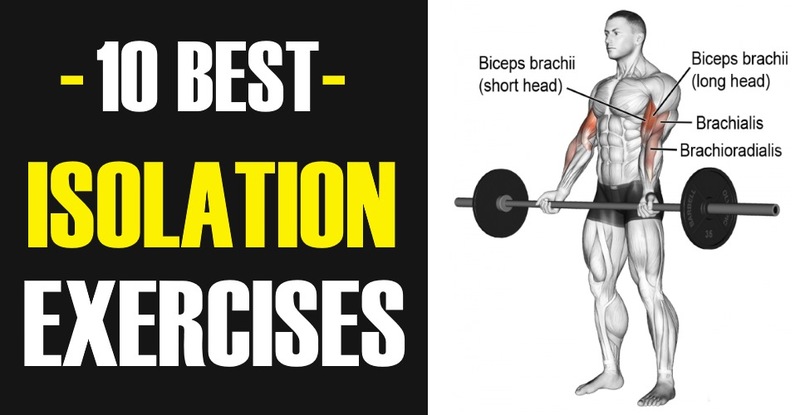 Out of all the triceps exercises, I think this one is the best for this list because it has the best effect on activating your lateral and medial triceps heads, while at the same time giving the long heads some attention as well. Cable push-downs can be used for a great list of effects, and it all depends on how you do them – what grip you’re using, what’s your current body position and what type of handle you’re using. You need to keep your overload progressive, which means you should keep adding on more weights to the stack every now and then. However, you also need to know exactly what you’re doing – don’t try out a million techniques at the same time. Instead, just pick one that works best for you and keep doing it for a few weeks to see the results. For best effect, I would suggest not flaring your elbows because it reduces the tension on the triceps. However, you can also burn it out and go for full-ROM mode, pushing towards lockout. If you can do that, if you can get past those last few inches, you will be glad when you see the amazing results! This exercise targets the middle deltoid muscles and it works so well that everyone has done it. If you’ve been to the gym only once, you probably did this. 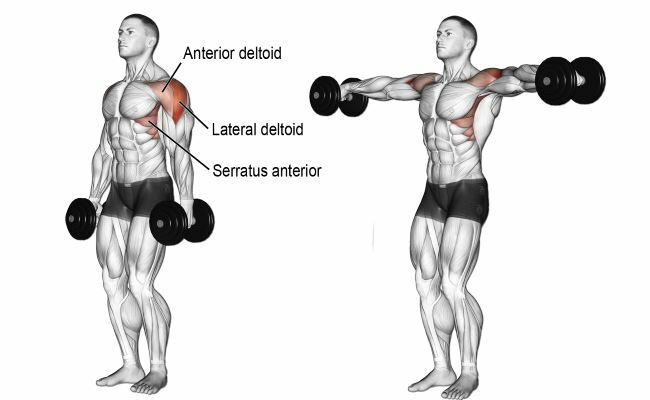 If you raise your upper arms straight out to the side, you will hit your middle deltoids hard. Keep putting on weight and you’ll be good to go – it’s just that good and simple! When you do this exercise while standing, you can lift more and express your lifts much better than while doing them seated. However, note that you shouldn’t do everything just because you can – if the weight is too hard and you don’t keep proper form, the effect will be minimal. 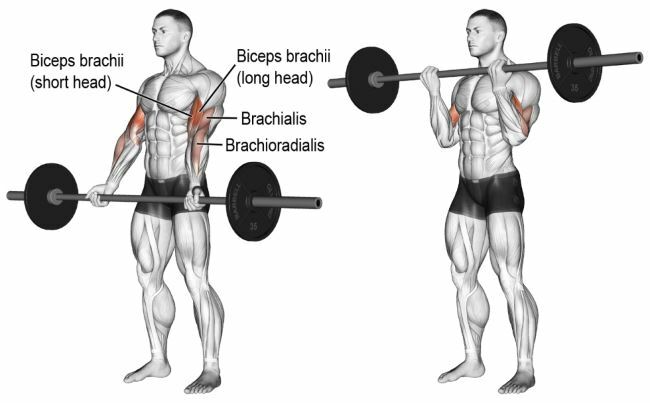 So, keep a little bend in your elbows while you’re doing the standing dumbbell lateral raises, but also remember to keep your elbows up because if your upper arm doesn’t completely go to the side, you won’t get the best middle head effect. Millions of coaches out there say this sentence at least once per day: “lead with the elbows”! The reason for this is that it works, and even people starting their training for the first time in their lives will be able to follow the logic here. Also, you can practice your raises on a lateral-raise machine which will clarify the body’s mechanics and help you understand how you move before you push onto dumbbell exercising. 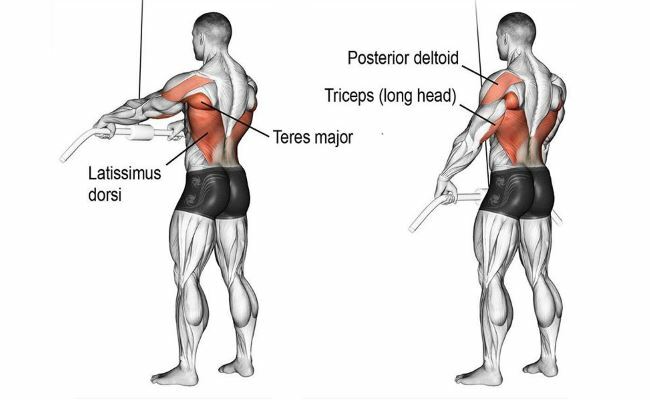 This exercise targets your rear deltoid muscles and I believe it’s the best one for them, even if the rear deltoids aren’t a priority on shoulder day very often. If you want to do these, make sure that you feel every single contraction that you get – don’t just throw the weight around because it will have no effect. I bet you’ve heard all about how free weights are better than machines, but the reason I picked out this one over the rear-delt raise is twofold: one, because you get about ten percent more muscle activation with the machine and two, because you can’t cheat the machine like you would be able to cheat the free weight movement, losing your isolation effect in the process. For best effect, use more than one grip – this means that you can do the exercise with both overhand and neutral grip, which means your palms would be facing inwards. Switching grips isn’t just for fun – each grip treats the rear deltoids a bit differently than the other. 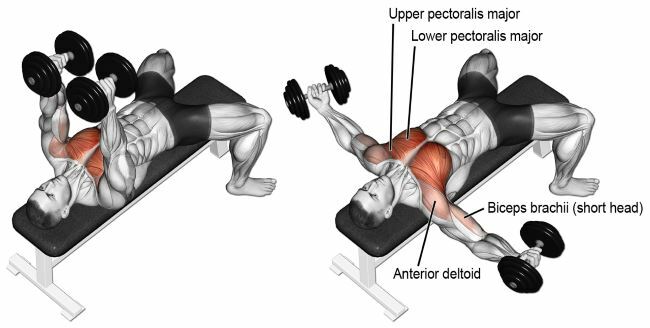 This exercise targets your chest muscles and it’s awesome because when you keep your elbows slightly bent, all of the dumbbell fly’s effect goes to the shoulder joints, which is what an isolation exercise is supposed to do. Usually, when you switch from an exercise involving more joints, to one involving only one, you can lift much less weight. Logical, right? Fewer joints mean less power to lift the weight. Just look at the difference between what you can lift when doing dumbbell presses on a flat bench and flyes on the same bench. You can mimic this point to match incline and decline surfaces too, or even with cables using the lower pulley position. For best effect, be careful not to overstretch your shoulders when you’re putting the weights down. This seems simple but when your arms are extended it can become complicated. You should feel your chest muscles stretching, but when you feel anything more than that, it’s time to stop. 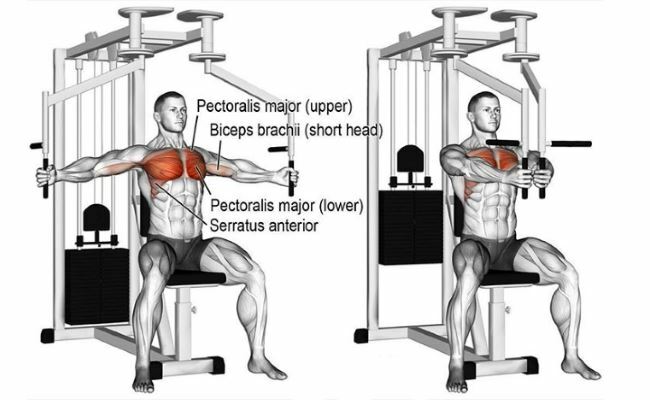 This one targets the pecs too, and the major difference is that this is a machine exercise instead of a free-weight exercise. So why are they both on the list? Simple, because I’ve seen a whole lot of people not being able to keep their slightly bent arm that way which means they’re still putting triceps power in the exercise without even knowing it. However, when you use this machine, it doesn’t give you any choice in keeping your form. If you’re just starting up now, feel free to practice the movement on this machine so that you can do it with dumbbells in a certain period. It’s similar to hugging something really big, so it shouldn’t be too difficult to do, however the machine is also better for performing dropsets or partial reps for your inner chest muscles. For best effect, change the seat position to have your shoulders, elbows and hands in the same, fully horizontal plane. Also, you need to keep watch on your elbows throughout the exercise – make sure that they’re elevated and don’t allow yourself to drop them. This exercise targets the hamstrings. If you’ve been in the gym for a while you will know that most leg exercises are either squat-type techniques such as squats, lunges or pistols, or isolation techniques such as hamstring curls, leg extensions and calf raises. While both are very useful, single-joint exercises can help you isolate muscle because you can do them with machines and machines don’t let you make mistakes in your form. Anyone can do machine hamstring curls, and everyone does them on leg day because they take a huge toll on your leg muscles, even more so than other single-joint exercises. They will get your muscles online really quickly and keep them there, but they will also help you get them pumped up when you do some forced reps, rest-pause training or even dropsets! For best effect, when you’re done with the heavy sets, try these. They go great with Romanian deadlifts because they move around the hip joint instead of the knees. 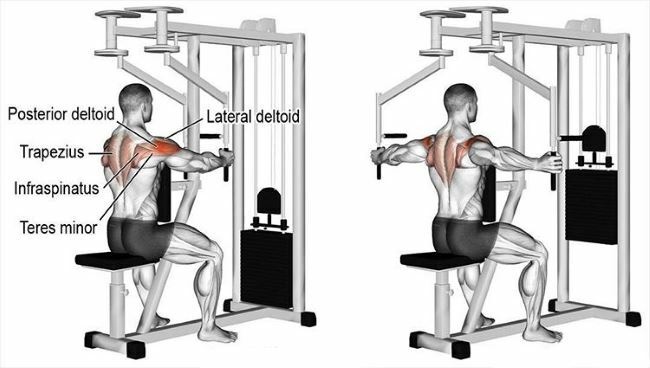 This exercise targets your lateral muscles(lats) and if you do it right you will probably eradicate the targeted area. I would suggest beginning with a light weight while focusing on squeezing your scapulae down and flat while at the same time cinching down on your laterals. Begin your move with an emphasis of the eccentric, and then focus on raising the bar in front of you and then all the way over your head, completing an overhead stretch. This exercise will give you amazing pump, try it out and see for yourself! For best effect, don’t stand fully vertical. Take one or two steps back from the pulley and slightly lean in. This means that you will get an amazing stretch, but you also won’t be able to pull a lot of weight like it’s possible to do in the bent-arm lat pull-down. However, seeing as this exercise is practically the best for the muscles you are trying to activate, you don’t need a lot of extra weight to see the results that you want.